Additional staff vacation days and warm weather resulted in limited financial savings that did not significantly affect institute costs during the holiday shutdown, although Vice President for human resources Laura Avakian said that staff did appreciate the extra days off. Cooper said that based on the electric usage, people did stay away on the Friday after Christmas and also the Monday and Tuesday afterwards for the most part. “They clearly started coming back and turning things on the day after New Year's, and then the weekend started to ramp up, and were at full blast again the following Monday,” Cooper said. Cooper said that utilities had calculated an estimate of steam and electric savings during the shutdown, but declined to disclose it, saying that it had been submitted to the chain of command. However, the office of John R. Curry, Executive Vice President, stated that it has not yet received this estimate. “It’s not a big number,” Cooper said. Data about MIT’s power generation and usage can be accessed at http://cogen.mit.edu. Meanwhile, Institute staff received additional vacation time during the shutdown, Avakian said. “Staff got an additional five days of paid time away, other than the two holidays,” she said. “In reality, I think the Institute would have given them the two Fridays, under any circumstance, if there is a day separating the holiday from the weekend. They've tended to do this,” Avakian said. Avakian said that the original thought about closing the Institute for some of that time came during budget discussions about the salary freeze. Given the sacrifice it is asking of staff, she said, the administration thought the additional vacation time would show sensitivity to what people were going through. Avakian said that they tried to give as many people time off while keeping important services going. 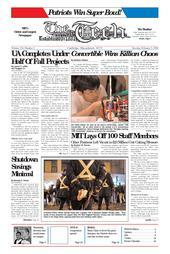 The MIT Police, as an example, added patrols and staff during that time, because they wanted to make sure that buildings left empty would be safe and secure, Avakian said. “Places where we have people living on campus never really close. Libraries still needed to stay open,” she said. She said it would be difficult to calculate lost productivity from the shutdown and additional vacation days. “The reason we felt we could do the closing at that time is because it's a really light time in terms of work that's going on around campus. The majority of faculty and students are away. Normal meetings don't happen,” she said. She said that it was difficult to measure exactly what productivity was lost during the shutdown. “I frankly don't know how we'd get our arms around what work didn't get done,” she said. “I had enormous numbers of thanks for extending the holiday period,” Curry said. “A lot of people were ... very appreciative,” Avakian said. She said that she expects there to be pressure to do it again. “This is being put forward as a unique opportunity given the budget climate of the year, and frankly, that Christmas and New Year’s fell on Thursday,” Avakian said. Curry said that he doesn’t think there will be such a shutdown in the future.